1 Grill chicken on aluminum-foil-lined grill or broil on aluminum-foil-lined baking pan, turning once, until chicken is thoroughly cooked and golden, about 20 minutes. 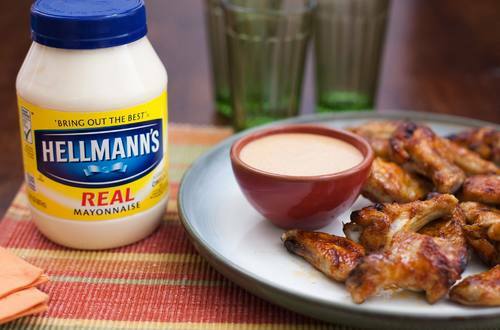 2 Combine Hellmann's® or Best Foods® Real Mayonnaise and pepper sauce in large bowl; add cooked chicken and toss to coat. 3 Serve with blue cheese dressing.